The goal of our this club's fearless leader (the amazing Becky M.) is to introduce titles that will pleasantly surprise society members, like all book clubs, titles may not be ones members would choose to read on their own. She’ll definitely be open to book suggestions from the kids, but she will try to have three options for them to choose from every month to keep things simple. The Young Readers’ Society is about giving kids a safe place to talk about books and reading and to express their opinions openly. Parents will be encouraged to browse the shop, or grab a bite to eat in Ballard, but as far as the Society goes – no grown-ups allowed! For those kids who were not able to make our August meeting, but who have read our June pick, The Emerald Atlas, I want to let you know about a contest we’re having through this next month. If anyone is interested in writing a recommendation (what we booksellers call "shelf-talkers") for The Emerald Atlas, my coworkers and I will be picking our favorite, and I’ll announce the winner at the next YRS meeting. The prize for the winner is the advanced reader copy of the sequel, The Fire Chronicle, which will be coming out in hardcover on October 9th. Feel free to drop any entries off at the shop during the month – a simple paragraph about why you like the book is all that’s necessary. September's meeting is going to be a little different. Alison Church from the Nordic Heritage Museum will be coming to talk to us and possibly do some crafts. Our book selection is Nordic themed so kids can choose one of the following three books: Pippi Longstocking, By Astrid Lindgren How to Train Your Dragon, by Cressida Cowell (the first in the series) and Sea of Trolls by Nancy Farmer. We’ll be discussing the differences between the books and talking about what makes them Nordic. Just a quick warning as well, Sea of Trolls is recommended for readers ages 10 and up. This is because of the size of the book, not because of the content, but if you have a younger kid who is interested in reading it, please be aware that it is a bit more advanced. These kids are all such good readers that I’m sure it’ll be a breeze for most of them, but if you have concerns please feel free to pick one of the other books instead. Don’t hesitate to call Becky M. anytime with questions/comments. Or, you can write her directly by clicking the contect us text above left. Chicago Public Library discusses The Sea of Trolls. Nancy Farmer's book Is SHE Available was available from LibraryThing Early Reviewers. 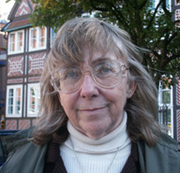 Nancy Farmer is currently considered a "single author." If one or more works are by a distinct, homonymous authors, go ahead and split the author. Nancy Farmer is composed of 4 names. You can examine and separate out names.